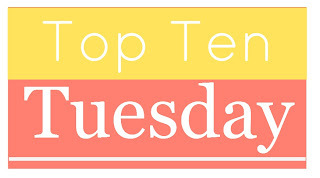 The Broke and the Bookish : Our Bookish Bucket List -- Top Ten Tuesday! - Own a first edition copy of Brave New World by Aldous Huxley. I've often joked that the only way I'll accept a marriage proposal is if I'm being handed that book instead of a ring. - I want to own first-editions of every Stephen King book! (But first I want to own every Stephen King book. Baby steps. - Work in a bookstore. - Own and read every Nancy Drew book. - Read a REALLY long book. Like 800 pages or more. - Restart and finish reading Anna Karenina. I know I’ve mentioned this a few times but I guess my hope is the more I mention it the more accountable I’ll feel? So far it hasn’t worked. But I WILL finish reading the scarily huge book that is Anna Karenina. - Own a house with my very own library! In my dream world it would be similar to the library in Beauty and the Beast! But I’d be satisfied with a room dedicated to my books! What's on YOUR bookish bucket list?? Reading Anna Karenina was on my list, too! I've wanted to read it ever since seeing the Keira Knightley movie version, but it's such an intimidating book! I love all these - reading and owning every Nancy Drew? WOW! That's incredible! Owning a gorgeous personal dream library in my house - that's also on mine. Would be amazing. This is only my 2nd time joining in but I am really enjoying this meme! Work at bookstore isn't on my list but is definitely something I would enjoy doing! What a wonderful list. I need to read more classics, too. I think the problem is that you're forced to read them in high school and it can leave a bad taste in your mouth if those classics don't relate to you in some way. Jana, my recommendation for a long book would be The Stand by Stephen King. A must read for any King fan (Would you agree with that Bridget?) but also a fabulous book. My favorite of all time. Looks like home libraries are on a lot of lists. I would kill to have a library in my house. xD That would be awesome. My first time participating! What fun -- thanks! Jana, read the Outlander Series, that will get you your 800 pages easily.... every single book in the series is over 800 pages. Oh wow. What an undertaking! I've heard great things about the series, though, so this is a great idea! This is awesome that you guys are joining in on the Bookish Bucket Lists!!! Hopefully people will choose to link up to the 50 Bookish Things You Must Do Before You Die, too! I always enjoy your topics. Thank you for the idea. Jen - Let me know when you read Anna Karenina, maybe if we all do it together, we'll get through it. We could have a huge virtual reading party of this huge book! This week was an interesting experiment! I feel like I could have easily come up with more than ten things but I managed to keep it down to 10. I also feel like I was more vague than I could/should have been. Ah well! I also put having my own home library on my list :) It's just something that needs to happen! Nice list and great topic! I loved reading a lot of the lists and seeing some common themes: a home library, work in a bookstore/library, write a book, go to BEA. And some of the more unusual ones, too, like read a million pages. Thanks for coming up with this one! My wish is to be able to enjoy the art of reading until the day I kick the bucket. This was a good topic choice! Bridget-Love both your goals. I agree about the Stephen King books. Although I'd want all mine signed as well. Jana- Reading all the Nancy Drew books is something I want to do as well. It didn't make my top ten but it is still a goal of mine. My TTT @ Vailia's Page Turner. And yes please to making meeting everyone happen! It's my first time linking up though I read a lot of TTT posts. I was updating my bookish bucket list anyway so thought I would link it up with you all too. I totally would love a library like Belle's! Thanks for hosting.